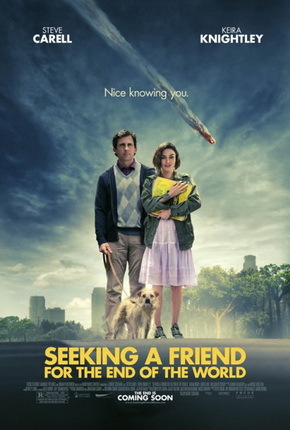 At its core, "Seeking a Friend for the End of the World" is a heartfelt film. At first glance, it might look as if this is your typical over-the-top comedic film mixed with some drama and romance or in short, a not-so-serious film. But this is far from what "Seeking a Friend for the End of the World" is. This is a deep and even a thought-provoking film on life, love and everything else in between. Too bad though it is slightly ruined by its unusual pacing in terms of its main characters' relationship towards each other, a final act that completely shatters what could have been an impactful sacrifice and an ending that some would find jarring to say the least. Dodge Petersen (Steve Carell) and his wife are listening the news on the radio. It is announce that a Space Shuttle mission failed to stop the comet Matilda from hitting the Earth. The mission was the final chance for Earth's survival and with that, the every living thing on the planet have at most 3 weeks left to live. Dodge's wife suddenly runs away from him and leaves Dodge alone. As Dodge suffers with the reality that his wife has left him, he tries to rekindle an old love from his high school sweetheart. With him is Penny Lockhart (Keira Knightley), his neighbor, whom Dodge promises to provide a plane to travel to Europe. Will dodge be able to fix things from his high school sweetheart and will Penny be able to see her family again with less than 3 weeks left or will they discover something else in that short span of time? One of the best assets of "Seeking a Friend for the End of the World" is the chemistry and acting chops of its two leads. Both Steve Carell and Keira Knightley surprise with a performance that comes out as heartfelt and real but also their unlikely chemistry as a couple. Not only is the acting good but they also bring out a comedic dimension that gives the film a unique feel to its drama aspect. Too bad that the film fails to be more compelling as its falters with its pacing. At times, the film felt rushed with the relationship between the leads suddenly becoming too positive in an instant. The final act also felt misplaced. Without spoiling much, it just felt that whatever happened shouldn't have happened that way (and we are not talking about if the world actually ended or not). Another minor thing that may tick people off is the haphazard portrayal of the end of the world. Yes there are moments of chaos and riots but there are more scenes of peace and serenity. But hey, no one has yet to experience the apocalypse and what should happen is open to interpretation. In summary though, "Seeking for a Friend at the End of the World" is a great watch that should make you think not only about the fragility of love but also the value of life itself.